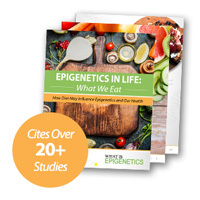 High Fat Diet in Fruit Flies Links Epigenetics to Inherited Heart Disease | What is Epigenetics? In the United States, obesity has become an epidemic that has been sweeping the nation for quite some time. Poor dietary habits have become far too customary among the American people, so it is no surprise that obesity rates are extremely high. Obesity presents a person with numerous adverse health effects that can shorten life expectancy like hypertension, diabetes, and perhaps most importantly, heart disease. Heart disease is currently the leading cause of death in both men and women in the United States, and there are currently about 6 million people living with heart failure. Heart disease can be caused by a number of different factors, such as a poor diet, smoking, lack of exercise, and may even be inherited through epigenetics. It is extremely important to maintain a healthy lifestyle, especially if you plan on having children. As we know, an expecting mother needs to keep an eye on her diet, as she may epigenetically predispose her children and grandchildren to potential health risks later in life. But the exact mechanisms on how these risks are inherited are unknown. Scientists from the Sanford Burnham Prebys Medical Discovery Institute may be able to help shed some light on the issue, as they have discovered an epigenetic mark found in fruit flies called H3K27me3, which may play a role in the development of a condition called lipotoxic heart disease. In this condition, fat cells accumulate in the heart and hinder its ability to function properly. In the study published in Nature Communications, Dr. Rolf Bodmer and his team wanted to determine how a high fat diet can affect both the parents and their future generations. They found fruit flies to be advantageous for their research as they share 80% of disease-causing genes with humans and reproduce every few weeks, making it easy to track inherited traits. They also share similarities in heart structure and function and are considered an ideal model organism for research regarding heart disease. The research team began the study by feeding a group of fruit flies a high fat diet consisting mostly of coconut oil for five days, focusing mostly on the effects it had on the females of each generation. The female flies quickly began to gain weight, and experienced the symptoms of lipotoxic heart disease. Interestingly, both generations (children and grandchildren) of the mothers who were fed the high fat diet also experienced these symptoms, even though they had not been fed a fat-rich diet themselves. They compared the offspring from the high fat diet flies to the offspring from flies who ate a normal diet and found that, when histone methylation mark H3K27me3 was reduced, the future generations were protected from heart failure. The scientists also identified two metabolic genes called bmm and PGC-1 as leading regulators in proper heart function. These genes were found to be silenced in the children and grandchildren of the flies that were fed the high fat diets, which in turn led them to experiencing signs of heart failure. Contrastingly, when the two genes were over-expressed, the same group of children and grandchildren were protected from heart dysfunction—even if they were fed a coconut oil diet. Although this study yielded some valuable insight on disease heritability, more research is needed in order to determine how we can change the outcome for future generations that may be susceptible to a life-altering disease. Reference: Sanford Burnham Prebys Medical Discovery Inst. “Epigenetic change causes fruit fly babies to inherit diet-induced heart disease”. SBP News. 14 Jan 2019. Web.